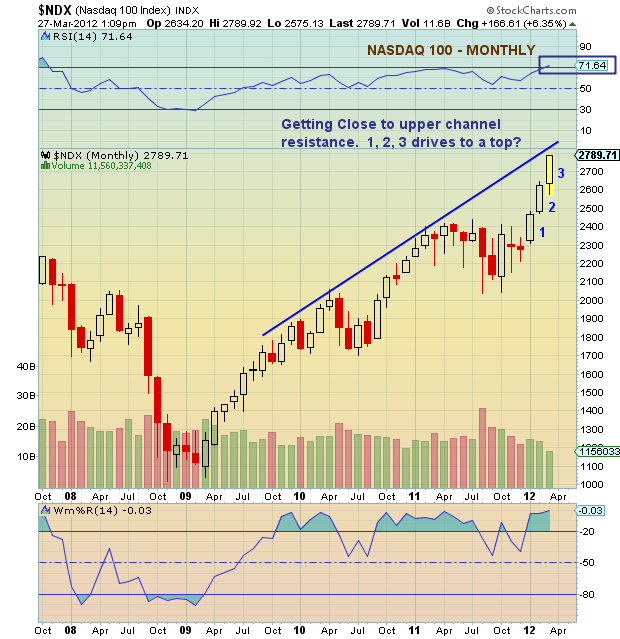 Last week gave us a correction in stocks, but upside resumed yesterday. Apple continues to print topping candles and then reversals. Broadly speaking, indicators are not screaming overbought or overbullish, so for now the medium term uptrend remains in place. Bernanke’s dovish comments provided a trigger yesterday for gold and miners to move up, which was in line with the overbearish extremes both had reached. Oil continues to range trade but in what looks like a bullish flag. The Euro and Dollar are at an important decision point. I have updated and extended my short and medium term models (see pages of those names). There is some near term downward pressure next week into the 7th April. Medium term, the message remains that stocks have run above the models and should now be brought back into range, in overall sideways action. Quite a downtrend in place since the turn of the year, and unless this turns up then stocks should eventually exit their uptrend. 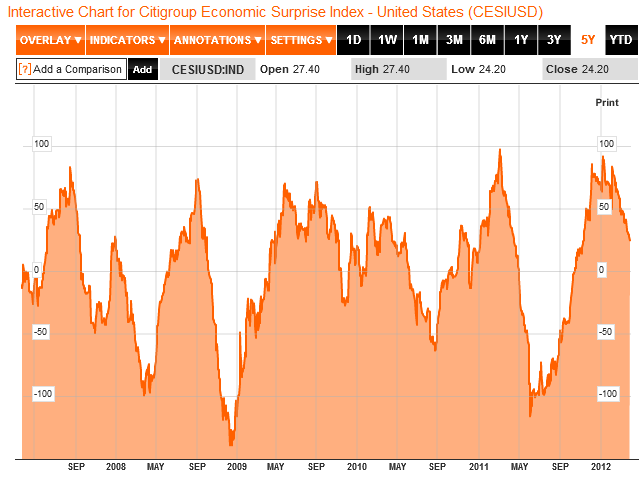 Here is the updated overlay of the surprises index on the S&P500. In both recent examples of 2009 and 2011, once the surprises index topped out, the stock market moved from uptrend to sideways/down consolidation a few months later. 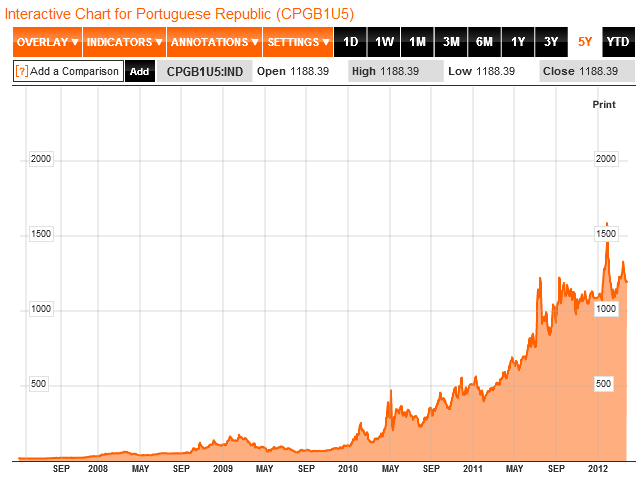 How’s Euro debt? 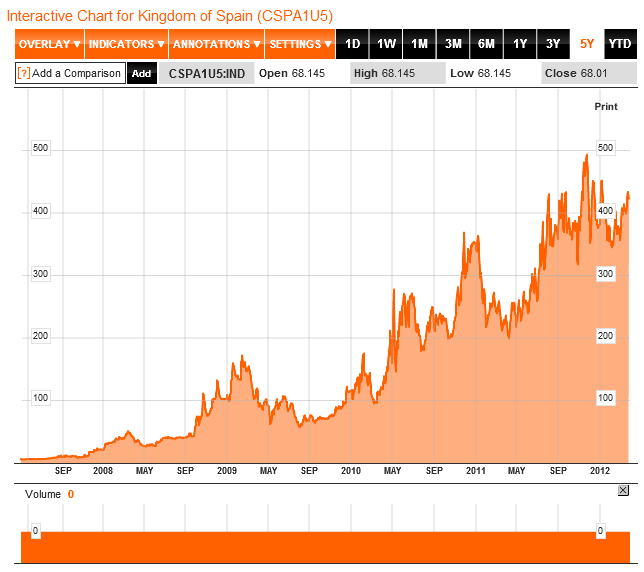 Here are Spain and Portugal 5 year CDSs. They remain in their longer term uptrends. 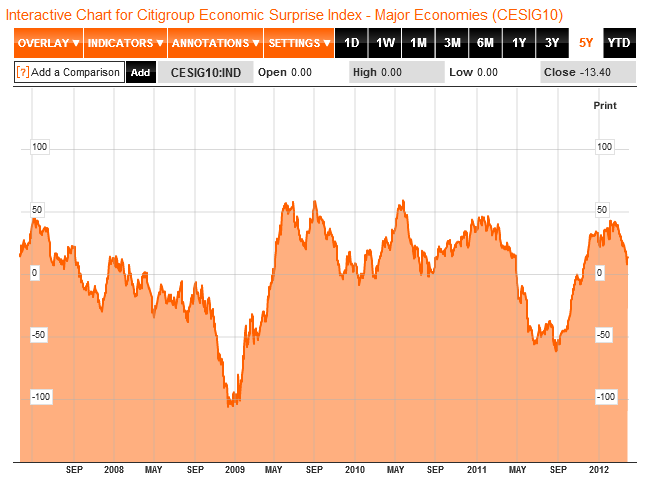 Unless they can break down decisively, then it suggests Euro debt will come to the fore again at some point in 2012. Let’s see. Trading-wise, I am currently doing nothing. I am hopeful that gold may now take off, with yesterday’s trigger and the overbearish extremes reached, and I am well positioned for that. Oil looks strong, both technically and fundamentally. Agriculture is picking up again, slowly. Again, I am positioned for both those. The Euro-Dollar remains finely balanced and I continue to monitor. I have a negligible stock indices long position. I do not wish to short equities, whilst leading indicators continue to improve. 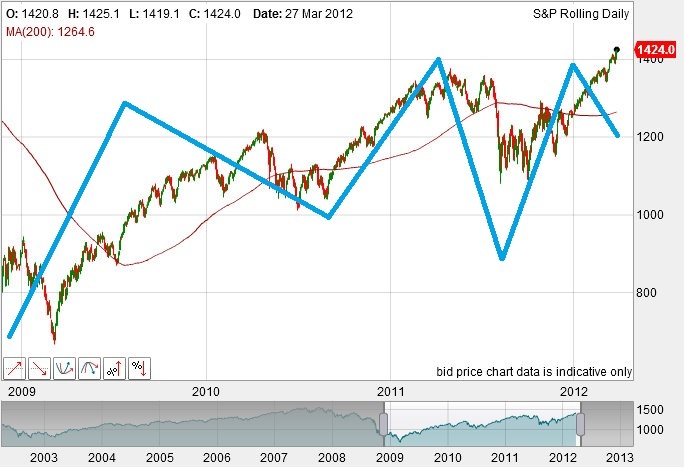 I do not wish to go long equities, whilst divergences build in surprises and geomagnetism. I am awaiting a more clear cut opportunity in stocks, whenever that comes. If last week’s higher low for gold holds, it will have traced out a perfect rhyme with its October/November 1979 correction. I posted a while back that if this rhyme completes, then the breakout will be late March/early April. I’m experiencing the most unusual solar phenomenon of them all at the moment – a week of sunbathing weather in Donegal during March..! ps. sorry JH for going off piste. Apple is a biggest short very soon!